Gov. Jay Nixon is continuing to defend a decision to withhold more than $170 million from the fiscal year 2012 budget, despite a constitutional challenge from another statewide official. In June - before the current Missouri budget began in July - Nixon announced plans to withhold money from more than 40 state programs, including higher education, the Missouri Department of Transportation, and Area Agencies on Aging. Nixon said the funds were needed to pay for disaster relief efforts following a deadly tornado in Joplin and historic flooding in northwest Missouri. Last week, auditor Tom Schweich - a Republican - filed suit, saying the governor overstepped his constitutional authority because withholdings can only be made if revenue is coming in below projections. Nixon, a Democrat, called his decision a common practice. "Spending your accounts to zero is not the way to start a fiscally prudent year," he said. "In order to have the resources to meet the obligations we have, me and governors over the last 40 years have done the exact same thing." Nixon's budget director has said the state does not know how much disaster relief will cost, but the governor said today that he reached the $170 million by taking out revenue lawmakers had included in the budget but never passed the legislation to collect, such as a tax amnesty program. The governor also said today that the state will have the resources to continue clean-up from the May tornado, even though the federal government's temporarily suspended long-term aid so the Federal Emergency Management Agency can direct immediate resources to areas hit by Hurricane Irene. The state is already receiving the most important aid, Nixon said. "We've got the debris almost completely moved out of there," the governor said. "We're not in the demolition phase down there, which are two of the more expensive first steps, Plus, we already had approved the individual assistance that's providing employment now to almost 800 people in the region." Nixon says he remains reluctant to tap into Missouri’s rainy day fund to help pay for disaster relief. 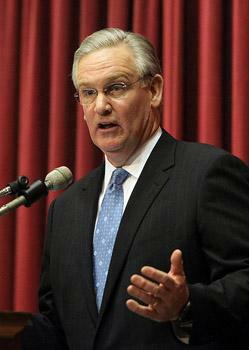 He says the fund is the state’s cash balance, and spending the revenue could put Missouri’s credit rating at risk. Updated with comments from Schweich, statement from Nixon. Missouri state auditor Tom Schweich has released a report that is sharply critical of Gov. Jay Nixon's decision to withhold $172 million from the current budget to help the state cope with a series of natural disasters. U.S. 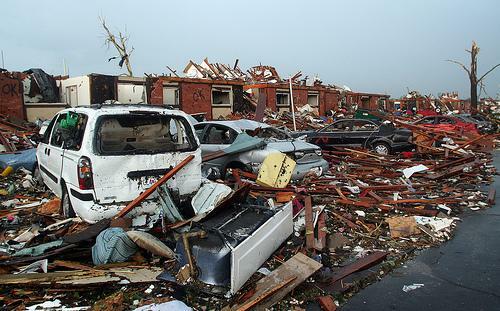 Senator Roy Blunt (R-Missouri) wants the federal government to pay 100 percent of the cleanup costs from the Joplin tornado. The federal government typically covers 75 percent of the costs of responding to disasters, with state and local governments picking up the rest. But Blunt says he has asked Homeland Security Secretary Janet Napolitano to pick up more than that in Joplin’s case.